The Ak Qoyunlu (Ak Qoyun or Ak Koyunlu) were an Uzbek Turkic tribal confederation which settled in eastern Anatolia (modern Turkey) during the mid-fourteenth century, while the region was politically divided. They initially emerged as part of a sizeable force of Shiite Turkic Afshari tribesmen who were in the service of Shah Jalal al-Din Mingburnu of Khwarazm in the early thirteenth century. The shah was desperately attempting to retain his domains in the face of a tidal wave of Mongol attacks under Chingiz Khan, but he was eventually forced to withdraw to the western side of the Caspian Sea to govern a reduced shahdom. Shah Mingburnu was overrun again by 1231 and the shahdom fell, but his subjects now had easy access from the shah's late heartland in Azerbaijan into Anatolia and northern Mesopotamia. The greatest consequence of this was that Turkic Afshari tribesmen in eastern Anatolia went on to form the Karamanid emirate which staunchly opposed the Seljuq Turks. The nascent Ottoman empire put an end to them only for Timur to resurrect them from his empire around Persia. Further Turkic Afshari tribesmen operated under the banner of Ak Qoyunlu, being attested around Bayburt province (north-eastern Turkey) in the 1340s. They took Diyar Bakir on the banks of the Tigris (now one of the largest cities in south-eastern Turkey) after conquering it from one of the descendants of the former Ayyubid governor, Saladin. Alternatively, they were granted it by Timur towards the end of his life (accounts differ), but either way it became their capital in 1402. From there they created their short-lived White Sheep emirate, although in its early years it was pegged back by the rival Black Sheep emirate. 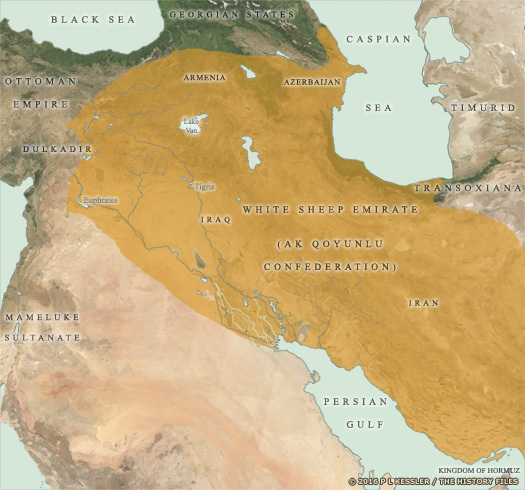 Under the leadership of their first two great leaders, Qara Osman and Uzun Hassan, they were quickly able to extend their territory to incorporate Armenia, Azerbaijan, eastern Anatolia, and parts of northern Iran and Iraq, and then much of the rest of Iran. Keen to establish a dynasty and increase their power, many of the White Sheep emirs married into the ailing Byzantine royal family. This policy was foiled in 1453 when the eastern Roman empire fell to the Ottomans. Regional tribal chief. In Bayburt province. The Chaghatayid conqueror, Timur, invades the Caucuses and eastern Anatolia from his power base in Persia, winning the support of the Ak Qoyunlu along the way. Greater Armenia is conquered and Timur massacres a large part of its population. Son. Killed by his brother and rival, Qara Osman. Timur defeats, captures and imprisons Ottoman ruler Bayezid I at the Battle of Ankara, making Anatolia another province of Timurid Persia. In return for his support now and during Timur's invasion of the Caucuses and eastern Anatolia in 1386-1394, Qara Osman is granted Diyar Bakir on the banks of the Tigris (now one of the largest cities in south-eastern Turkey). Conflicting reports state that the Ak Qonyulu conquer it from one of the descendants of the former Ayyubid governor, Saladin. 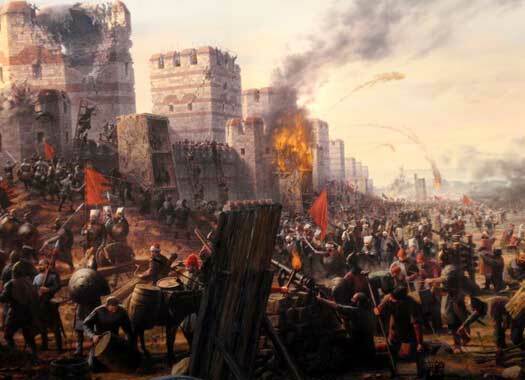 Constantinople, capital and heart of the fading Eastern Roman empire, is captured by Mahomet II of the Ottoman empire, and Greece becomes an Ottoman province. The loss is viewed as a disaster for the Christian world, despite Rome's frequent differences with the Orthodox church in Constantinople over the centuries, and with its emperors. It is also far from welcome news for the White Sheep emir and his family, whose Byzantine brides are rendered virtually worthless in terms of political influence. Uzun Hassan is responsible for the death of the powerful Black Sheep emir, Jahan Shah. He threatens to overwhelm the entire Black Sheep emirate, despite it receiving assistance from Abu Sa'id of Transoxiana, and he achieves his aim in 1468. Abu Sa'id is captured in the Azerbaijan mountains in 1469 while on campaign against the White Sheep emirate. He is subsequently handed over to Yadigar Muhammad in Southern Khorasan, which is focussed around Herat, where he is executed. Having requested military aid as early as 1464 from one of the most powerful of the opponents of the Ottoman rulers, Venice, Uzun Hassan is disappointed to find that the aid fails to arrive when he most needs it. Instead he is defeated by the Ottomans at the Battle of Otlukbeli in 1473. The Ak Qoyunlu survive, however, but in-fighting is triggered by the defeat. Khalil Murza immediately faces a coalition of opponents from within the emirate, headed by his brother, Yaqub. The two sides meet at the Battle of Khoy in July 1473 (the far north-western corner of modern Iran) and Murza is defeated. Yaqub himself has to put down seven pretenders to the throne in the first four years of his reign, but after that the emirate remains relatively stable. With Yaqub's death the emirate is thrown into chaos once more. Civil war grips it as various contenders vie for power and the emirate effectively destroys itself from within. The Safavid leader begins to chip away at any remaining unity by undermining allegiance to the emir. Between 1491 and 1493 there is no overall ruler of the emirate as rival claimants fight between themselves. Rival grandson of Uzun Hassan. In his retreat from the victorious Safavids, Ahmed destroys an autonomous Ak Qoyunlu splinter state that has formed in the region of Mardin (south-eastern Turkey). His removal from power in the same year (the reasons are unknown), results in a permanent north/south split of the remaining Ak Qoyunlu territory - Diyar Bakir and Azerbaijan in the north, and Iraq, Isfahan, Fars, and Kerman in the south. Rival grandson of Uzun Hassan. In Diyar Bakir & Azerbaijan. Brother. In Iraq, Isfahan, Fars, & Kerman. Brother. First cousin of Alwand. In Isfahan, Fars, & Kerman. The Safavid leader, Esmail, defeats the Ak Qoyunlu at the Battle of Nakhchivan (in modern Azerbaijan), forcing the White Sheep to relinquish Tabriz (on the Iranian side of the modern Azerbaijani border) and much of Iraq. Esmail is subsequently enthroned as shah of Azerbaijan. Despite his family connections with Uzun Hassan, he is intent on building his own empire centred on Iran while the White Sheep emirate is effectively destroyed by the defeat. Son of Ahmed. In Diyar Bakir only. Control of Diyar Bakir is succeeded by another rival claimant, Zayn-al-Aibidin bin Ahmed bin Ughurlu Muhammad, who continues to hold the city until his own end in 1508. Murad continues to hold power in Isfahan, Fars, and Kerman until his death, and both territories are absorbed by the Safavids. Several of the descendants of Uzun Hassan subsequently play a role in the politics and campaigns of the Ottoman empire.